Coin collecting is not just a hobby for numismatics anymore – investors of all levels are easily seeing the potential for portfolio growth in gold and silver coins. Though not every coin is eligible for an investment portfolio, there are a wide variety of options for investing in coins. One of the best places to start is with high-grade, government-minted American gold and silver coins. American coins have a history as rich as the country itself. The United States Mint was created under the Coinage Act of 1792 and placed under the Department of State. The Mint started converting precious metals into commercial coinage at no charge, but it wasn’t until 1893 that the Mint became a part of the U.S. Treasury. American coins minted during the 18th, 19th and early 20th centuries feature some of the most beautiful designs and purest grades, like the world renowned Saint Gaudens Eagle. Some of these early American gold and silver coins are extremely rare and can pull quite a hefty price. Yet, you don’t have to own a rare 1836 Seated Liberty Half Dollar to be a serious coin collector or investor. The most important factor of investing American coins is ensuring the coin has a high grade, or purity. Not all coins are created equal, and not all coins are accepted into investment portfolios. A coin must meet certain standards of quality; for example, American silver coins and bars must have a 0.9999+ fineness to be accepted into a precious metals IRA, and American gold coins (with the exception of the American Eagle) must be pure 24 karat gold, like the prolific American Buffalo. Many common coins are lower grade metal and often mixed with other alloys, so it’s important to identify the quality of coin and investment stipulations before investing. Not to fear, though, there are plenty of high-quality coins available; the U.S. Mint is still producing bullion gold and silver coins that are investment-quality. One of the best investment-quality gold coins is the American Gold Eagle, which is only 22 karat gold, but whose content and purity is backed by the U.S. government and acceptable for precious metal IRAs. Perusing the different variations of American coins, from classics to new bullion, can be both interesting and lucrative. Ask an SBC Gold coins representative for more information on American gold and silver coin investing, or see below for different American coin options and availability. The American Eagle Gold Coin is an official American gold bullion coin and was introduced in 1986 by the U.S. Mint, after the release was authorized by the Gold Bullion Coin Act of 1985. The American Eagle is available in four sizes: 1 oz, ½ oz, ¼ oz and 1/10 oz. The U.S. government guarantees that the coins contain the stated amount of actual gold weight in troy ounces. The American Silver Eagle Coin is the official American silver bullion coin and was first released by the U.S. Mint in 1986 after its release was authorized by the Liberty Coin Act of 1985. The coin only comes in 1 oz and has the nominal face value of $1 The American Silver Eagle is guaranteed to contain one troy ounce of 99.9% pure silver. The U.S. Mint certifies the content, weight, and purity of the coin. The American Platinum Eagle is the official American platinum bullion coin and was first released by the U.S. Mint in 1997. The Platinum Eagle is available in four sizes: 1 oz, ½ oz, ¼ oz and 1/10 oz. It is the only bullion coin the United States Government guarantees for weight, content, and .9995 purity. 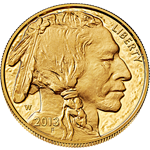 The United States Mint introduced the American Buffalo 1 ounce Gold Coin in 2006. It is a 24-karat gold bullion coin available in 1oz size. The American Gold Buffalo coin is designed after the famous 1913 Type 1 Buffalo Nickel. The Indian Head gold pieces or Pratt-Bigelow gold coins were in fact two identical coins: a two-and-a-half dollar coin (“quarter eagle”) and a five-dollar coin (“half eagle”). 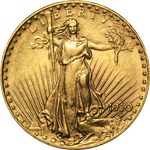 Roosevelt sought to beautify U.S. coins in 1904 and choose the sculptor St. Gaudens for the Saint Guadens Gold Double Eagle. Considered by many as the most beautiful of the U.S coins. Morgan silver dollars were minted in 96 different date-and-mint combinations and hundreds of millions were melted over the years. Nevertheless, vast amounts of Morgan dollars still piled up in the Treasury’s vaults, as well as in bank vaults nationwide. The Peace dollar is a silver U.S. coin that was minted from 1921 to 1928, and then again from 1934 to 1935. 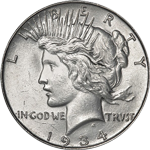 The uncirculated coin is the most desirable Peace dollar and can yield quite a large profit and all Peace Dollar coins contain 90% silver and 10% copper. Saint-Gaudens, the most prolific sculptor in American history, designed a new Liberty double eagle coin when Theodore Roosevelt commissioned him. Even in circulated condition, a Seated Liberty half dollar is worth a lot more than fifty cents. The numismatic value of most Seated Liberty halves exceeds their bullion value considerably. 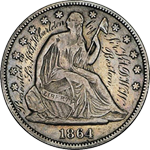 The United States Mint produced Seated Liberty dollars from 1840 to 1873. The Seated Liberty was the last dollar silver coin to be struck until the Coinage Act of 1873, which temporarily halted production of silver dollars for American commerce. Both the Seated Liberty half dime and the Seated Liberty dime look and feel similar, so it is important to check the face value on the reverse. The Seated Liberty half dime is a U.S. silver coin that was minted from 1837 to 1873. The first silver half dime was produced in 1792 by the U.S. Mint, the “1792 half disme”, followed by the Draped Bust and the Capped Bust half dime. Given the range of values for several conditions and mintages of Seated Liberty quarters, this series may give collectors with varying budgets a chance to complete sets. These silver coins can be worth far more than their face value today due to their added numismatic value. The U.S. Mint produced relatively large amounts of these 90 percent silver dimes from 1892 to 1916, for a total of 504 million dimes. Many Barber dimes survived into present times too. Struck in large quantities between 1892 and 1916, there are a few scarce Barber quarter mint marks and date combinations, but there are not many that are truly rare. Compared to other coins produced by the U.S. Mint, Barber coins are usually considered simple and somewhat plain. Yet, it is important to note that Barber was not just a coin designer, he was also the Mint’s Chief Engraver.